Stelmach: Alberta’s Seinfeld, but we’re not laughing. Seinfeld was a successful “show about nothing”. 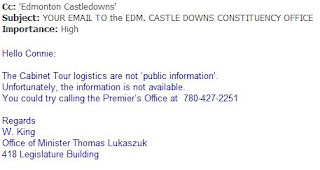 It’s becoming clear for average Albertans the “Cabinet Tour” is the “tour about nothing”. Here we are nearly a week later and I am faced with the fact that the venues and times are not going to be released. How can I be so sure of this? Let’s look at a couple of clues. There is a Facebook a group called the “The PC Discomfort Tour 2010”. Connie Jensen posted an email response she got when she inquired as to the details. “Logistics”??? We don’t need to know how they are travelling or what hotel they are staying at!! Just simple venues and times. 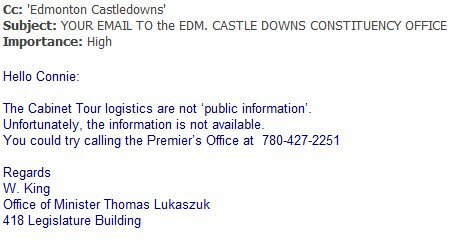 Today Don Braid reports that the Highwood PC Constituency Association wasn’t even advised of their own MLA being in town with other Ministers. One could write this off as punishment for the letter they issued in March. Do you know where I can find the locations and times for the Cabinet tour? No, sorry Jane. We aren't given advance notice of where they will be. I think the idea is that it's a surprise, perhaps to avoid media attention. I'm not sure. This really falls into the WT*? column. So we have Minister’s offices that will not release the “logistics”; they are not advertising in newspapers, the government isn’t sharing the information with their own Constituency Associations and they are not even informing their own MLA offices???? All of this is quite contrary to what Stelmach touts in his YouTube video. Well, okay they are Albertans, but these are people they can (and should) meet with anytime. .....because when you are in the capital city, especially in the Legislature building, you don’t get a chance to see people on their own turf. This tour has nothing to do with meeting with average Albertans. It is smoke and mirrors. They are publicizing a façade of a tour, when in fact they doing the things these ministers and MLA’s should be doing all year long. They then post pictures after the fact as if it is something new and of value to Albertans. There you have it; the “Stelmfeld Tour about Nothing.” There is no punch line and no one is laughing. Just a couple of photos of our journey so far. After about an hour of terrible winter driving, the conditions improved and we made our way down to Caliente. We stayed the night there and headed out in the morning on a secondary hwy #317. In reality it is a gravel road and despite signs warning it was closed we went ahead anyway.